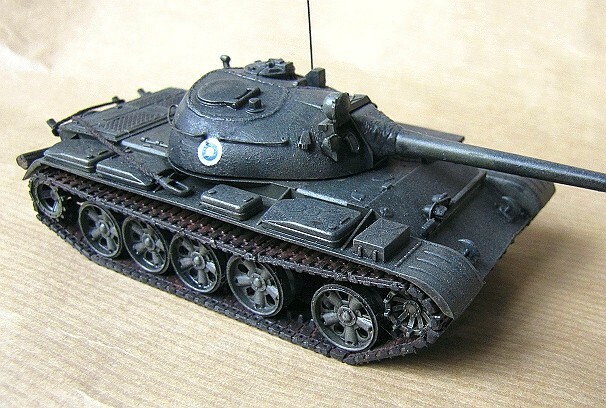 The T-55 model by PST looks to be a very nice and detailed kit, the sprues are crisp and include several spare parts meant to be used with the T-54 variant. 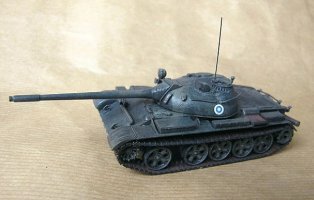 It apparently does have some inaccuracies (turret shape, gun barrel, wheels), but to me it resembles the real thing well enough. There is one missing feature, however, that Doug Chaltry has pointed out, and that I thought called for attention, too. 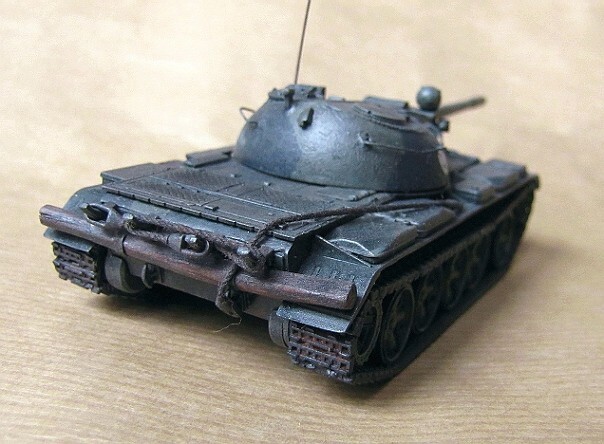 We are speaking of the prominent weld line on top of the turret, which is completely missing in the kit, but which on the real vehicle is quite characteristic. Some might also like the engine deck grilles with a more pronounced relief, but to me they were just fine as they were. I readily admit, that photo-etch would improve their looks, of course. The quality of the molding is very good, and I especially liked the realistically thin mudguards and the fine selection of stowage. The bottom of the vehicle is also exceptionally nicely detailed. The tracks are hard plastic, and otherwise very nice, but they would seem to be a bit too thick. There are no particular problems in putting the kit together and the fit of the pieces is fairly good all over. The installation of the link and length style tracks requires a fair amount of care so that they hang naturally, and PE tracks may be a favoured substitute by many modellers. Also the fit of the bottom and top sections of the chassis required some puttying both on the glacis and around the rear wall, as did the installation of the gun mantlet to the turret. These considerations apart, this was one of the most easily built kits I have tackled for a while and could almost be assembled out of the box. My build was very straightforward, as I saw no need for major surgery operations. Therefore I only did some detailing: I added the turret weld seams made of stretched and sanded down sprue, replaced the turret grab handles with ones made of metal wire, enhanced the folds on the canvas mantlet with a file and drilled out the headlights and rangefinder simulating their lenses with a drop of PVA glue. I also added a track log made of a real twig, towing cables made of thread and an antenna made of stretched sprue. I built my T-55 as an item in my collection of Finnish AFVs, and it is an approximation to show what the T-55s of the Finnish Army looked in the late 70´s - early 80´ configuration. 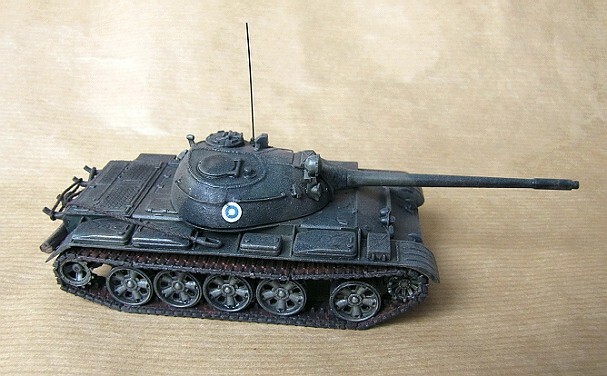 The Finns modernized their T-55´s during the 1980´s. This changed their appearance somewhat especially around the turret, but I was too lazy and ignorant to reproduce these upgrades. Very soon after basic building I was getting ready to paint, mark and weather the model. To achieve the Finnish look I painted the model a splinter camouflage of three colors (black, dark green, lighter green) with Tamiya XF-1, and XF-11 toned with white to two shades. Then I applied a highlighting with pale greenish white, applied the national insignia decals (taken from an airforce sheet), performed a black wash and oversprayed a diluted grey/satin varnish. And so the job was almost done. The finishing touch was given with some pastel chalk powder around the tracks, engine deck and exhaust. This was the first kit by PST that I have completed, but it will not be the last, for sure. I would say PST is now among the top seven or eight manufacturers doing small scale, also taking their interesting model range into consideration. They could do more profound subject research, though, to increase the accuracy of their kits.